Comfort with a touch of class. Nothing says Spring and Summer more than butterflies! These adorable lime green, white and turquoise butterflies fly over a white and black polka dot background. 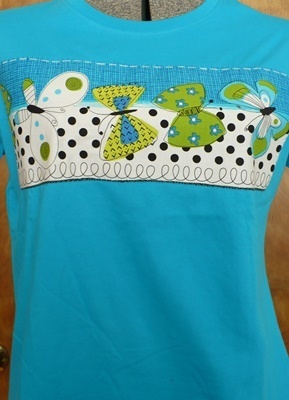 I've appliqued this fabric on a turquoise short sleeve ladies tee shirt.